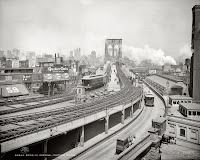 The Historic Districts Council (HDC), the citywide advocate for New York City’s historic neighborhoods, will host its 18th Annual Preservation Conference, “The Great Outside: Preserving Public and Private Open Spaces,” March 2-4, 2012. “The Great Outside” will focus on significant open spaces and landscapes in New York City, including public parks, plazas, parkways, yards, planned communities and public housing. Participants will examine a variety of issues such as development history, current threats, preservation efforts and future use. Speakers will address both broad issues as well as smaller, neighborhood-based battles. Attendees will gain a strong understanding of how open space conservation and preservation works in New York City. The conference is co-sponsored by more than 200 community-based organizations from across the five boroughs. The conference begins on the evening of Friday, March 2 with an opening reception and a keynote address, “Change, Continuity and Civic Ambition: Cultural Landscapes, Design and Historic Preservation,” by Charles A. Birnbaum, founder and president of the Cultural Landscape Foundation, the country’s leading organization dedicated to increasing the public’s awareness and understanding of the importance and irreplaceable legacy of its cultural landscapes. This event will take place from 6-8pm at New York Law School, 185 West Broadway in Manhattan. The conference continues Saturday, March 3 with two panels examining the preservation of public and private open space: distinguished speakers include author and curator Thomas Mellins- landscape architect Ken Smith- Thomas J. Campanella, Associate Professor of Urban Planning and Design at University of North Carolina- independent scholar Evan Mason, and Alexandra Wolfe of the Society for the Preservation of Long Island Antiquities. The Saturday conference will also present networking opportunities where attendees will learn about the latest campaigns dealing with open space concerns across the city. The Conference will be held at Cooper Union, 41 Cooper Square, between East 6th and East 7th Streets, Manhattan. On Sunday, March 4, HDC will host five related walking tours in a diverse group of New York City neighborhoods and sites with significant public and private open spaces, including Sunnyside and Woodside in Queens, public and private plazas of Midtown Manhattan, Woodlawn Cemetery in The Bronx, the North Shore Greenbelt of Staten Island, and a bicycle tour of the changing waterfront of Williamsburg and Greenpoint in Brooklyn. Advance reservations are required. Woodlawn Cemetery, The Bronx A National Historic Landmark with a stunning array of mausoleums and world class landscape design. Midtown’s Public Plazas See the renowned as well as little-known public plazas that dot the landscape of Midtown Manhattan. Many were designed by prominent landscape architects as public amenities. Northshore Greenbelt of Staten Island is part of the larger green belt that makes this the second largest area of city parkland in New York. Sunnyside, Woodside and Beyond. This tour highlights a variety of significant landscapes including the early garden style housing of Sunnyside and the public housing in nearby Woodside. Williamsburg and Greenpoint Waterfront Bicycle along this changing face of Brooklyn and learn about the large new waterfront towers, public parks and plans for the future. HDC will offer several pre-conference programs with content related to open space issues. On February 5 at 8:30am at 232 East 11th Street, Andy Wiley-Schwartz, assistant commissioner of the city Department of Transportation, will present new and affordable pedestrian spaces created from underutilized street segments through the DOT Public Program. Both of these programs are free to the public. Fees: March 2 Opening Night Reception and Keynote Address: $35, $30 Friends of HDC, Students & Seniors- March 3 Conference: $25, $15 for Friends of HDC & Seniors, Free for students with valid ID- March 4 Walking Tours: $25. Reservations are necessary for all programs. 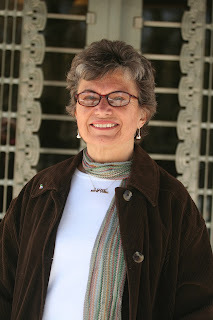 For more information or to register for the Conference go to www.hdc.org or call (212) 614-9107. 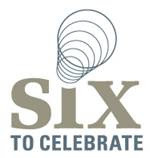 The 18th Annual Preservation Conference is supported, in part, by public funds from the New York City Department of Cultural Affairs in partnership with the City council and by the New York State Council on the Arts with the support of Governor Andrew Cuomo and the New York State Legislature. Additional support is provided by Councilmembers Inez Dickens, Daniel Garodnick, Stephen Levin and Rosie Mendez. The conference is also co-sponsored by the New York Chapter, American Society of Landscape Architects and more than 200 Neighborhood Partner organizations. 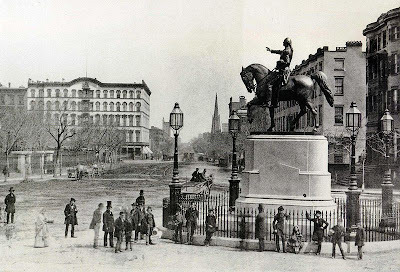 Photo: Statue of George Washington (by Henry Kirke Brown, 1856) in the middle of Fourth Avenue at 14th Street, circa 1870- the statue was later moved to the center of Union Square Park. Courtesy Wikipedia.